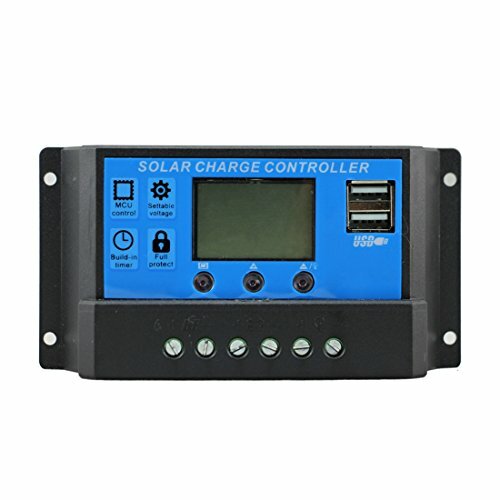 Solar Charge Controller : A Solar Charge Controller is an essential component of any Battery Based Solar System. 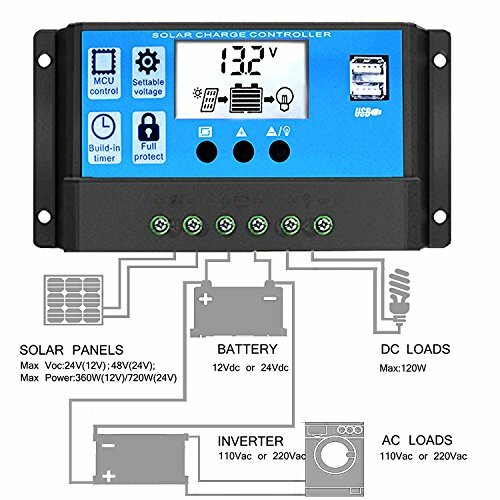 The Solar Charge Controller is the device making sure your Solar Panels are charging your batteries in an optimum fashion. 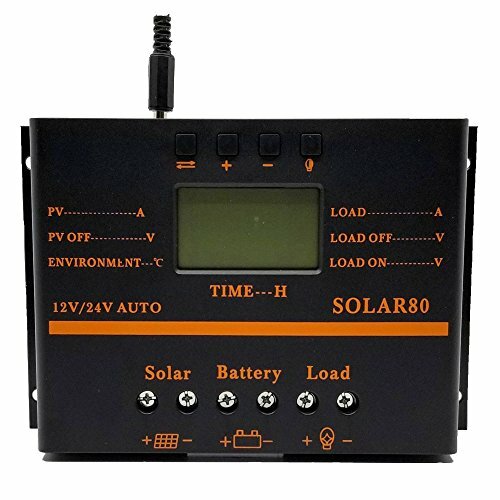 Solar Charge Controller : Off Grid Power - If you are frequent camper or have an off grid cabin you have likely thought about Solar Power. 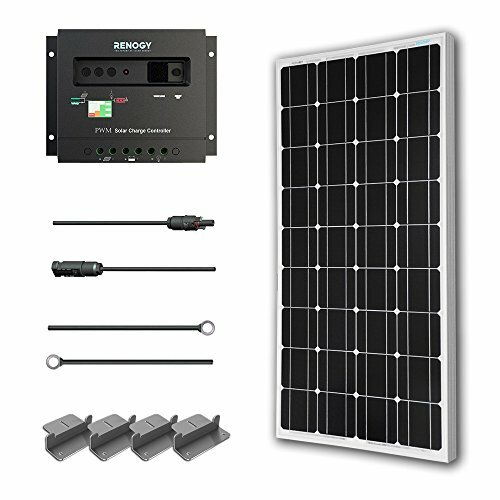 Solar Panels, Solar Charge Controllers, Inverters and Batteries are the main components of an off grid Solar Panel System. The freedom of having solar electricity courtesy the sun is energizing, pun intended. Solar Panel System : As a DIYer building your Solar Panel System, one of the critical components is the Solar Charge Controller. 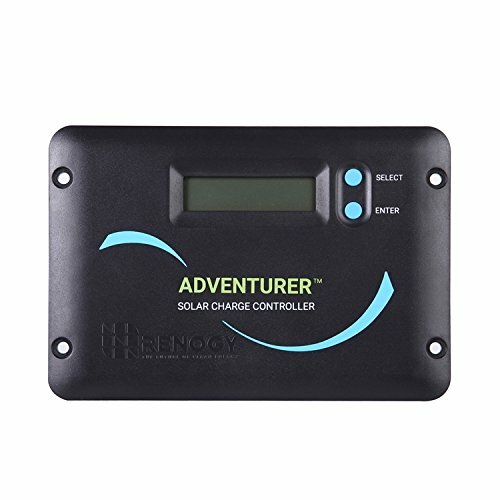 A Solar Charge Controller is an electronic device placed between your solar panels and the batteries. 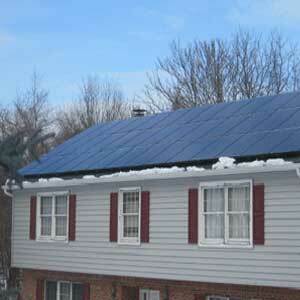 Click to read more about the other components of a Solar Panel Kit here. This Article will delve into the the basics of Solar Charge Controller and help you make an informed purchase decision. However, for those in a hurry, we have the Top PWM Solar Charge Controllers and the MPPT Solar Charge controllers showcased in the boxes below/right. Click away. This Article will delve into the the basics of Solar Charge Controller and help you make an informed purchase decision. However, for those in a hurry, we have the Top PWM Solar Charge Controllers and the MPPT Solar Charge controllers showcased in the boxes below/right. Click away. 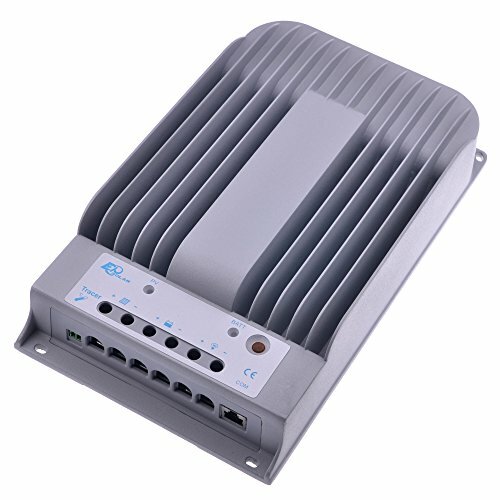 How to choose a Solar Charge Controller ? 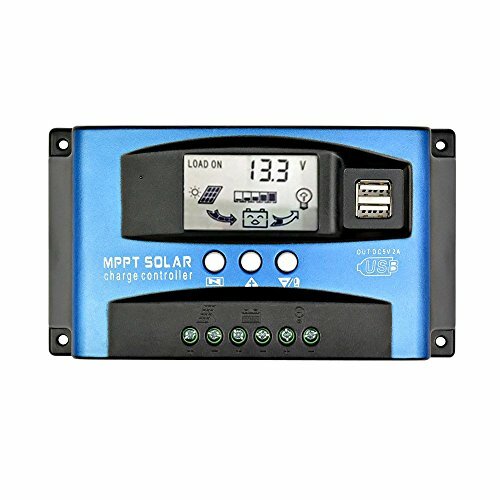 MPTT and PWM Solar Charge Controllers : There are the two main types of Solar Charge Controllers: PWM (Pulse Width Modulation) and MPTT (Maximum Power Point Tracking) Solar Charge Controllers. 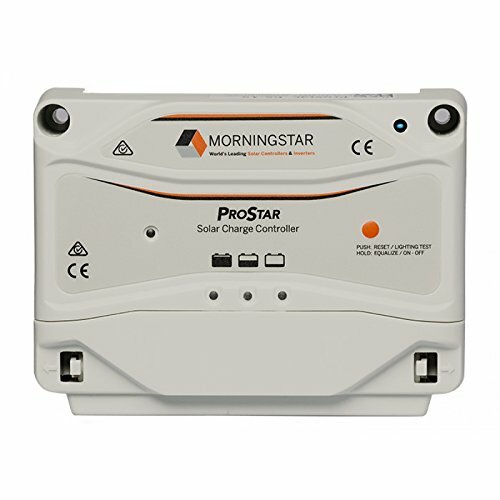 The best solar charge controllers are manufactured with safeguards and control features to ensure the fastest most efficient charging of the battery banks. 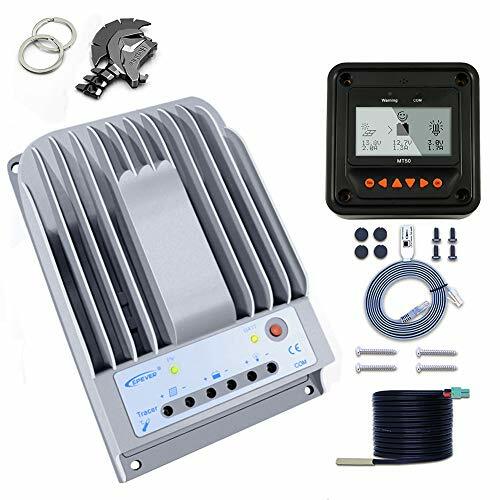 Additionally, the best PWM and MPTT Solar Charge controllers optimize and maximize the solar electricity generated by your solar panels to give the maximum power to your batteries. Higher efficiency charging and panel power utilization by your solar charge controllers leads to faster and safer charging of your batteries. 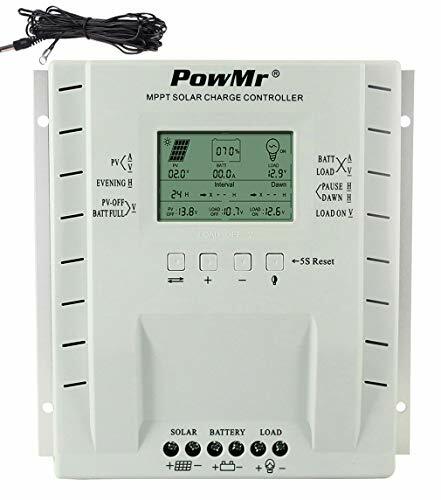 Now that you have read the basics about Solar Charge Controllers, here are our recommendations for the Best Solar Charge Controllers : PWM and MPTT. For the even more scholarly minded, here is the technical lowdown on everything Solar Charge Controller. 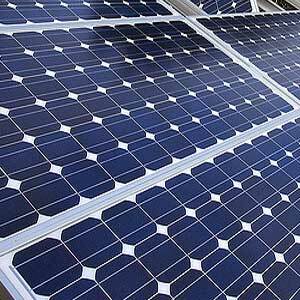 Solar Panels convert sunlight into electric power. This power then is fed into a panel of batteries to charge them. You then use the power stored in the batteries to power appliances on your RV, or your boat or your off grid cabin. 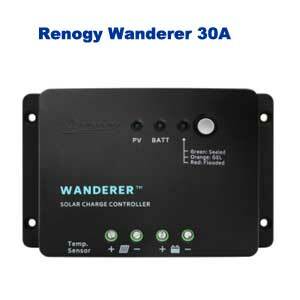 Charge Controller : This is an essential piece of equipment that resides between the solar panels and the battery bank. Solar Panels produce electricity at the beck and call of the sun. If you have bright sun, the panels will produce the most power. However, if a cloud obscures the sun, the power production suddenly drops close to zero. Such wild swings of power produced by the solar panels cannot be directly fed into your batteries. It would damange them permanently. 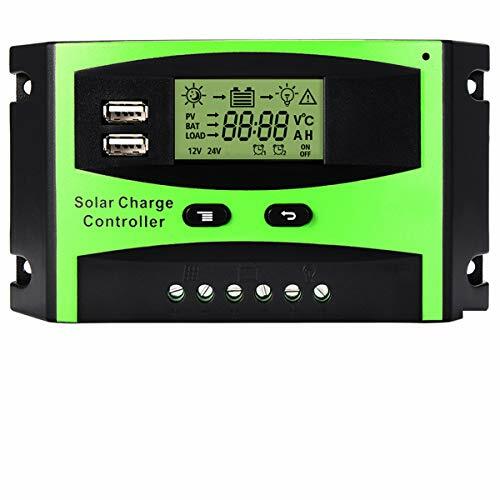 The solar charge controller is the control device in the middle to feed power into your batteries without over charging the batteries. The solar charge controller also prevents overheating of the batteries. They also prevent over discharging of your batteries. Most batteries are designed to operate over a certain level of charge, and a discharge below say 50% significantly degrades their performance. Finally, the solar charge controller prevents reverse flow of current from your batteries to the solar panels during the night. 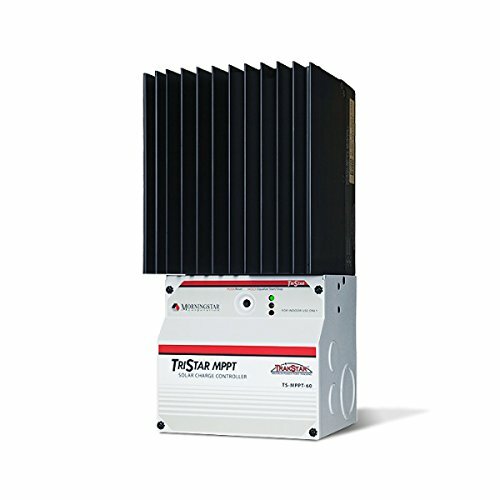 MPTT and PWM Solar Charge Controllers : There are two main types of solar charge controllers viz PWM Solar Charge Contollers and the MPPT Solar Charge Controllers. They are discussed in more detail here. Batteries are designed to work for a set number of charging and discharging cycles. Over charging or over discharging your batteries reduces the number of remaining charging and discharging cylces thus dramatically reducing your batteries life. 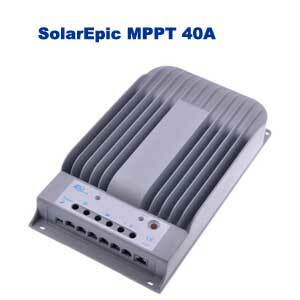 Thus, the solar charge controller is an indispensable piece of equipment in your solar panel system. Voltage : The solar panel array will be rated to produce electricity at a certain voltage and current output. Batteries are rated at different voltages. For example many common battery banks are built with more or more 12 volt batteries connected in paralell. Such a battery bank is rated at 12 volts. Solar Panel Voltage : In the above example, it would be essential to have solar panels producing power at atleast 14 volts or more. Unless the panels produce power at 14 volts or more, there wont be the voltage differential to make the electric power flow from the panels to the battery. Most 12 volt Solar Panels have an actual voltage output range of between 17 to 22 volts, and these would be appropriate for use with 12 volt battery banks. You can also use higher power solar panels producing power at higher voltages, but that would require the use of a Solar Charge Controller that can reduce the input voltage down to the 12volts of your battery bank. 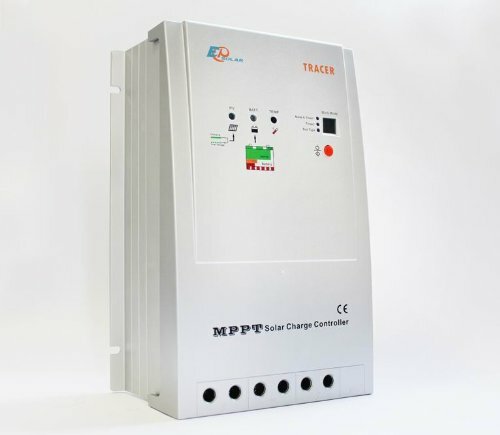 MPTT Charger Controllers have in-built transformers to carry out this reduction automatically. 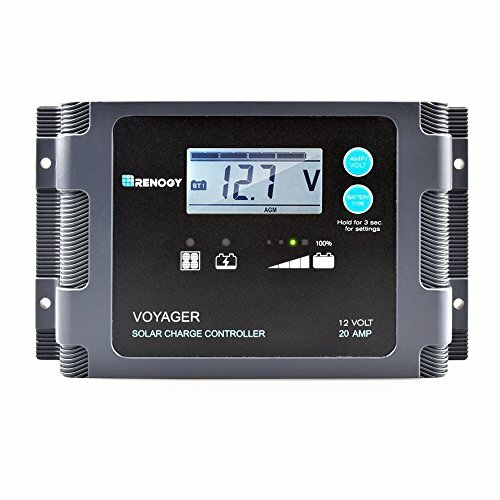 Solar Charge Contoller Voltage : All Solar Charge Controllers have a voltage limit. That is an important number to keep track of. The open circuit voltage of your solar panels must be less than your solar charge controllers voltage limit. For example most 250 watt solar panels have an open circuit voltage of about 38 volts. If your solar charge controller has a limit of 25 volts, you will not be able to use this panel with your charge controller. 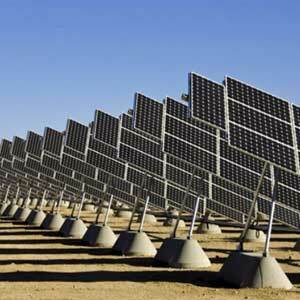 You should instead look for 100 watt or lower solar panel which have open circuit voltages of around 22 volts. 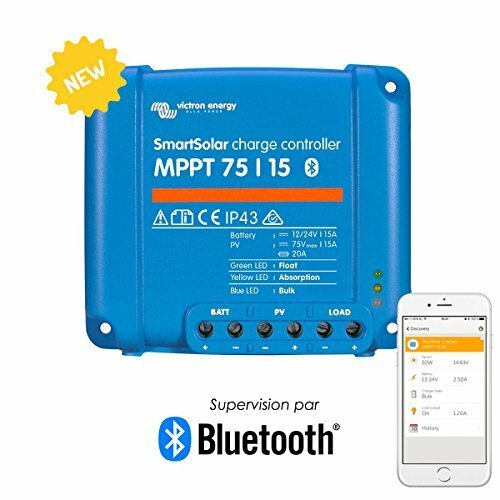 On the other hand many MPPT Solar Charge Controllers have voltage limits of 150V and you can safely connect them to 250 watt panels. Of course you must be careful to not exceed the 150 volt limit. Connecting more than 3 250 watt panels in series would be dangerous as their open circutit voltage would exceed 150 volts. Hence the limit would be three such panels in series. You could add more panels if you desire by placing them in paralell, thus keeping the voltage under 150 Volts. Solar Charge Contoller Current Rating in Amps: Each Solar Charge Contorller will also have a current rating in Amps. For example you might have a 15A rated solar charge contoler. 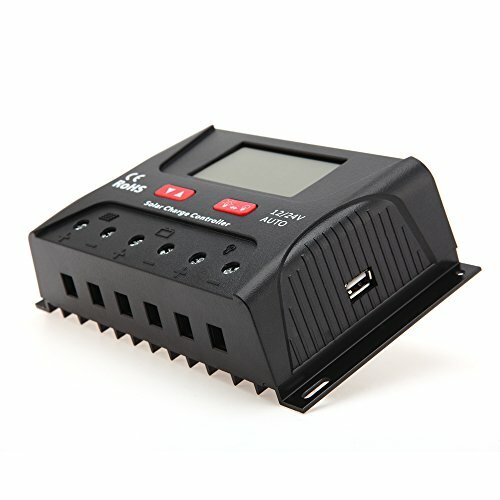 If your solar panels produce more than 15 Amps, you will not be able to use them with this solar charge controller. In the previous example we looked at using three, 250 watt panels as our solar panel array to power a 12 volt Battery Bank. The current produced by this array can be approximated by assuming the panels will produce about 90% of their rated power in real life conditions. Thus 250 x 3 panels x 90% = 975 watts. To calculate the equivalent current, we divide by the voltage of the battery bank. 975 / 12 = 81.25 Amps. Thus we would have to make sure our Solar Charge Controller is rated at 100 amps to ensure safety. 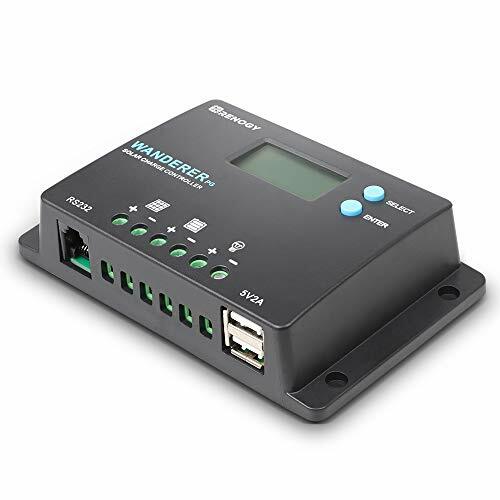 Pulse Width Modulation or PWM solar charge controllers do not control the input voltage coming in from the solar panels and provide a direct connection to the batteries. Thus connecting a higher voltage panel to a solar charge controller to charge a 12 volt battery is very inefficient. 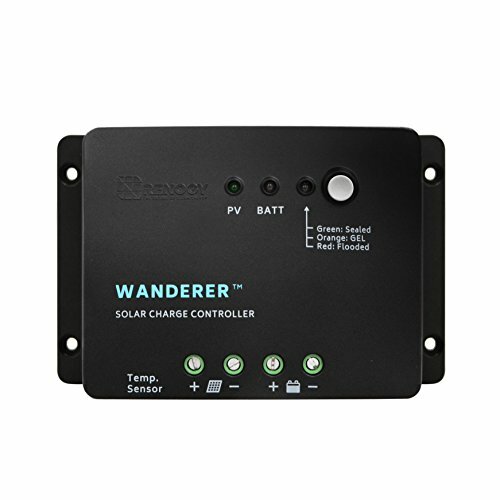 The solar charge controller will accept an input voltage of only 12 volts. The solar panel will charge your 12 volt battery, but since it is forced to works at 12 volts instead of its higher operating voltage range, it produces a fraction of the power it can produce. 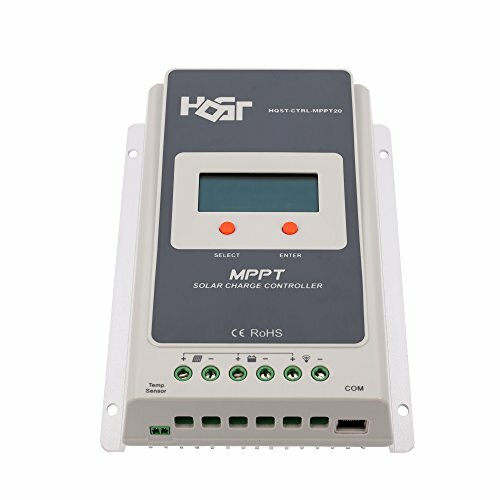 Maximum Power Point Tracking (MPPT) Solar Charge Controller : You are better served in a situation like this by using a MPPT Solar Charge Controller. MPPT charge controllers have a built-in transformer to step down the voltage and increase the current fed into the battery bank. Thus you are able to utilise the full power of your panels to charge your batteries. 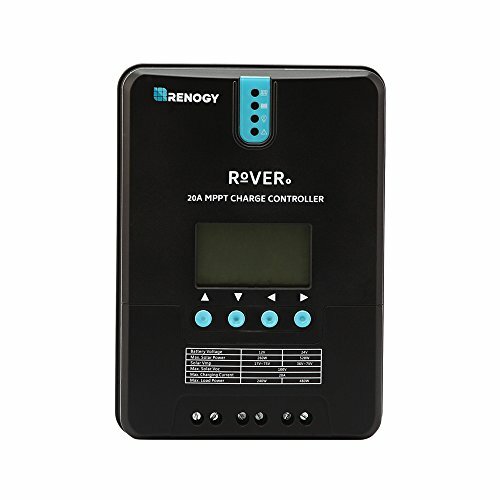 IMPORTANT RULE : Alway use an MPPT Solar Charge Controller when there is a large differential between the solar panel voltage and the battery voltage. 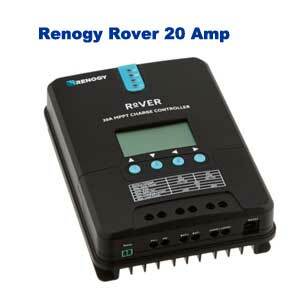 The Renogy Rover Series charge controller is suitable for various off-grid solar applications. It protects the battery from being over-charged by the solar modules and over-discharged by the loads. 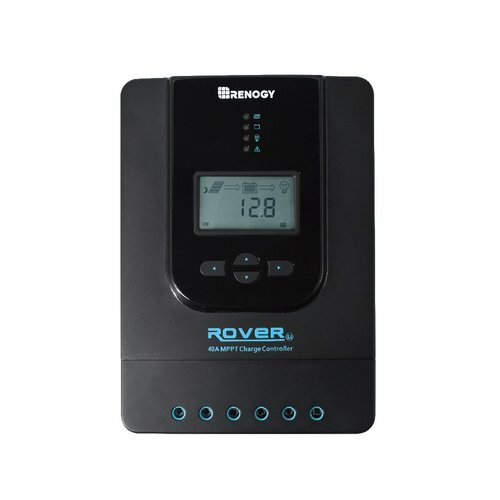 The Rover's charging process has been optimized for long battery life and improved system performance. It includes a 4-stage battery charging algorithm for rapid, efficient, and safe charging. LCD screen with programmable charging parameters; charging data with storage of up to 1 year. Over temperature, over charging, PV and load short, PV (battery) revered, over current protection. Programmable to Charge Battery Voltages from 12 VDC to 60 VDC. Advanced Continuous Maximum Power Point Tracking Increases PV Array Output by up to 30%. 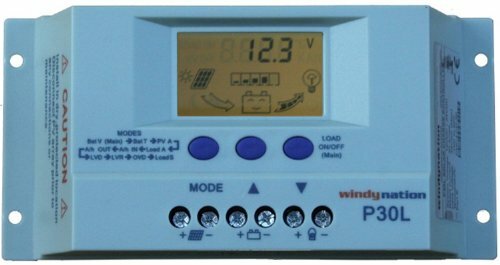 WindyNation P30L PWM 30 Amp solar charge controller prevents battery from being overcharged and damaged by the solar panel. Ideal for 12 and 24 volt batteries. Controller can be configured for AGM, lead acid, gel and other battery types. Battery temperature sensor (BTS) is included. See photo gallery. 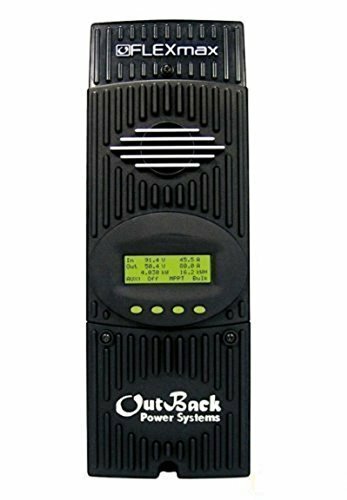 The Outback Flex 80, one of our top 3 MPPT Solar Charge Controllers is also our pick for the best 80 Amp model. 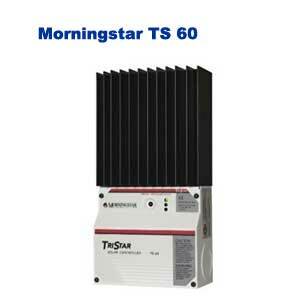 The Morning Star TS-60 is an excellent heavy duty PWM Solar Charge Controller rated for a maximum of 60 Amps. 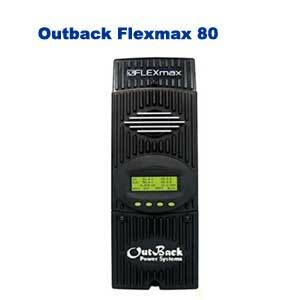 If you must have an 80 Amp Solar Charge Controller you will be better served by the Outback Flex 80. 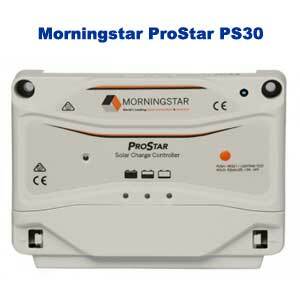 The HQST 20 Amp MPPT Solar Charge controller is our pick for the best 20 Amp solar charge controller. Reliable automatic limit function of maximum PV input power, ensuring no overload. 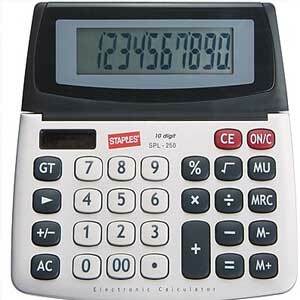 LCD panel display design, dynamically displaying tool's operating data and working condition. 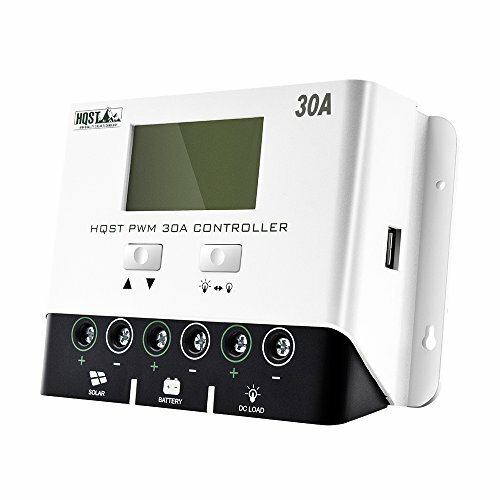 Multiple load control modes: manual mode, light ON/OFF, light On+Timer and test mode. 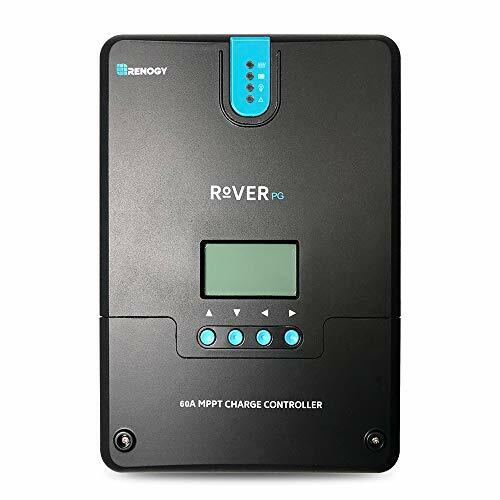 This is also our pick as the best 15 Amp and 10 Amp Solar Charge Controller as it is highly flexible and will out perform other lower powered solar charge controllers. This product belongs to Y-Solar brand, there are some unreliable follow sellers who sell counterfeit, please be careful. Battery Voltage: 12V/24V auto; Rated Charge & Discharge Current: 30A; USB Output: 5V/2A max. Adjustable charge/discharge control parameters, settable operating modes of loads, fully 4-stage PWM charge management. Multi-functional LCD display, dynamically display all the operating datas and working condition, can be conveniently switched working modes and parameter configuration. Dual mosfet Reverse current protection, low heat production. Build-in short-circuit protection, open-circuit protection, reverse protection, over-load protection, more safty for using, suitable for home, industrial, commercial etc. Easy to install and operate, come with a detailed user manual in English. 12-months warranty and professional after-sale service within 24 hours. 5 Stage PWM charging: Soft-Start, Bulk, Absorption. Float, and Equalization. 7 Battery Type Compatible - Lithium-ion, LiFePO4, LTO, Gel, AGM, Flooded, and Calcium. Smart PWM technology, high efficiency; Backlit LCD displaying system operating information and error codes. Waterproof design, suitable for indoor or outdoor use； LED Bar for easy to read charge state and battery information. Protection against: reverse polarity and battery connection, reverse current from battery to solar panel protection at night, over-temperature, and over-voltage. Features a 5V 1A USB output that can be used to charge mobile phones, tablets, speakers, etc. A wide range of load working modes facilitate the product's application to different types of load. Caution:Charge Controller should connect the battery first,and then connect the solar panel,and finally the load!The disassembly sequence is contrary to the wiring order. Charge controller is only applicable to various lead-acid batteries.Do not use other batteries (including lithium batteries, nickel-metal hydride batteries, etc.). 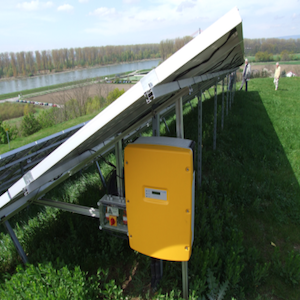 Charge controller can only use the photovoltaic panel as a charging source. Do not use a DC or other power source as a charging source. Charge controller will heat up when it is running. Please be careful to install the Charger controller on a flat, well-ventilated place. Battery life and improves system performance. Intelligent protection against reverse polarity, overcharging, short-circuit, and reverse current. 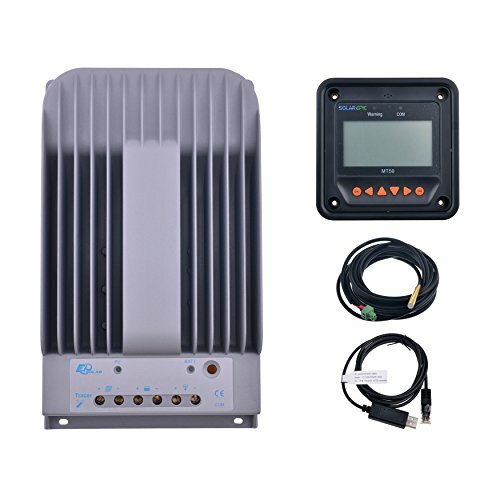 Support PC software and remote meter MT-50, be convenient for real-time data viewing and parameter setting. Battery temperature compensation function, real-time energy statistics function. More Safe Guarantee with Y-SOLAR: 2-years warranty and professional after-sale service within 24 hours. To thanks for your support, it will come with a keychain bottle opener, which is great quality and unique design, keep your keys well organized, you will like it. 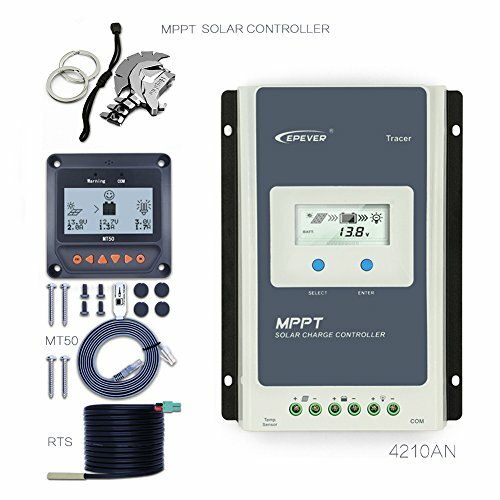 Positive Ground MPPT Charge Controller: featuring innovative MPPT (Max power point tracking) technology with high tracking efficiency up to 99%, maximizing the energy from solar panels to charge your system. Multi-stage charging (constant current, constant voltage and floating charge) and temperature compensation increase your battery life and improve your system's performance. Aluminum heat sink allows for efficient heat dissipation. Multi-protection: built-in intelligent against reverse polarity, reverse discharge, overload, short-circuiting, under voltage and reverse current. More Safe Guarantee with Y-SOLAR: 2-years warranty and professional after-sale service. To thanks for your support, it will come with a keychain bottle opener, which is great quality and unique design, keep your keys well organized, you will like it. Automatically detects 12V/24V/36V/48V DC system voltages. Deep Cycle Sealed, Gel, Flooded, and Lithium (12.8V LFP) battery option ready. Electronic protection against reverse polarity, overcharging, over-discharging, overload, short-circuiting, and reverse current. LCD screen and multiple LED indicators for displaying system operation information, customizable parameters, and error codes. RS232 port allows the Rover PG to communicate with the BT-1 Bluetooth module, which can pair with the Renogy BT smartphone app. You may also connect the included USB converter cable from the port to a PC to use the Solar Monitoring Software.